Any opinions, findings, and conclusions or recommendations expressed in this publication are those of the author(s) and do not necessarily reflect the views of the participating agencies or TAMU. 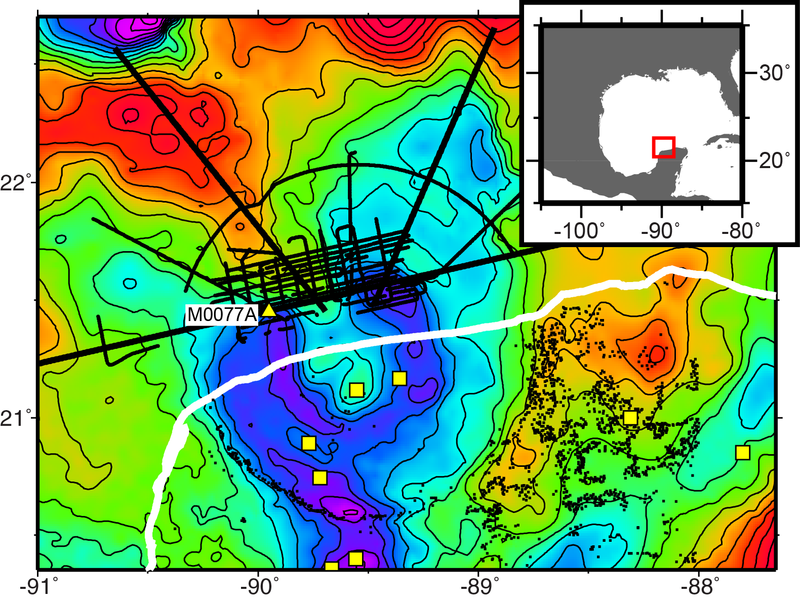 Expedition 364 was funded in part by the International Continental Scientific Drilling Program (ICDP). IODP mission-specific platform data are accessible at http://iodp.pangaea.de. If you cannot access this site or need additional data, please contact Data Librarian, PANGAEA, University of Bremen, MARUM, Leobener Strasse 8, 28359 Bremen, Germany. Tel: (40) 421-218-65592; Fax: (49) 421-218-65505. ESO expedition photos are the property of IODP and are public access. Cover photograph shows the L/B Myrtle on station at Site M0077. Insets: (left) thin section photomicrograph showing early Danian planktic foraminifers and a bloom of calcareous dinoflagellates from Core 364-M0077A-39R, (middle) line-scan image of suevite in Core 364-M0077A-89R, (right) shatter cone in amphibolite clast in Core 366-M0077A-81R. Photo credit: Chris Lowery (L/B Myrtle), Ludovic Ferrière (shatter cone), and IODP ESO. 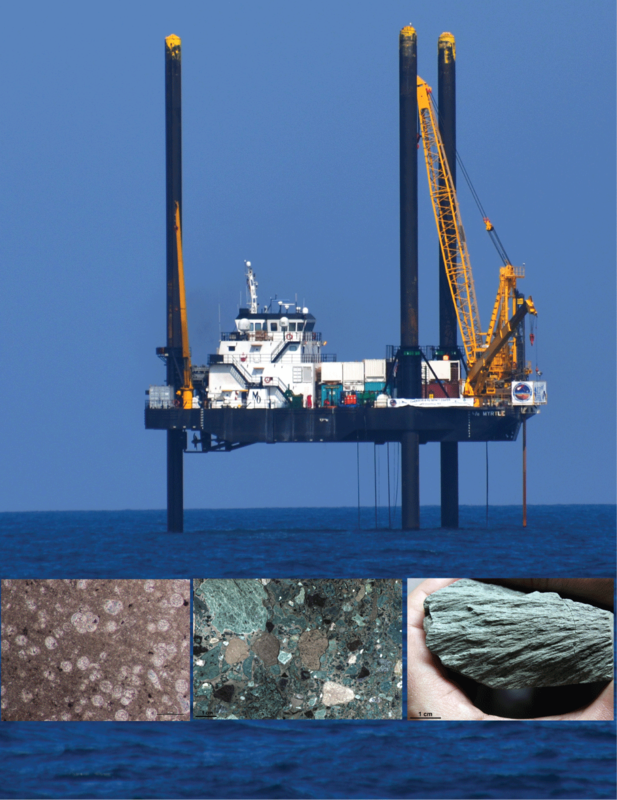 Examples of how to cite this volume or part of this volume are available at http://publications.iodp.org/proceedings/364/364title.html#bib. Supplementary material for the Volume 364 expedition reports includes age-depth, MAR, MAD, and fault-slip data in Microsoft Excel format; CT images, CT scans, core line-scan images, and slab core scans in JPG format; handwritten VCDs in PDF; and CT descriptions in a variety of native formats. A full list of directories can be found in SUPP_MAT in the volume zip folder or on the Supplementary material for Volume 364 expedition reports web page. A site map showing the drilling locations for this expedition and maps showing the drilling locations of all International Ocean Discovery Program (IODP), produced using QGIS (http://www.qgis.org), and Integrated Ocean Drilling Program, Ocean Drilling Program (ODP), and Deep Sea Drilling Project (DSDP) expeditions, produced using Generic Mapping Tools (GMT) of Paul Wessel and Walter H.F. Smith (http://gmt.soest.hawaii.edu), are available in PDF. We thank the National Science Foundation (NSF) and the Natural Environment Research Council (NERC) for funding the acquisition of seismic data, which allowed the spectacular images of the Chicxulub crater that were fundamental to site selection for Expedition 364. We thank the European Consortium for Ocean Research Drilling (ECORD) Science Operator (ESO) staff; Expedition 364 was implemented by Dave McInroy, with Dave Smith directing operations offshore. We are grateful to our Science Party members from México, the Universidad Nacional Autónoma de México, and the Yucatan State Government and Dr Raúl Godoy in particular for their contributions and support, without which the expedition would not have been possible. The International Continental Scientific Drilling Program (ICDP) provided funds for downhole operations and in kind support for the DOSECC-operated drilling rig. We thank Uli Harms in particular for many years of encouragement. We thank the Captain and crew of the L/B Myrtle for getting us there. We also thank the DOSECC drillers, who could not quite understand our excitement about recovering hundreds of meters of granite, Chris Delahunty for forsaking weeks of sleep to solve a myriad of drilling challenges, and Beau Marshall for going to great lengths onshore to make sure key rig parts arrived rapidly to the platform to minimize downtime. We thank ESO technical staff, including Erwan Le Ber for acting as the key go-between for the physical properties scientists and the shore-based management and Luzie Schnieders for being absolutely critical to the success of the geochemical and microbiological sampling and measurements offshore and onshore. Weatherford Labs and Enthought acquired and processed—unique to the International Ocean Discovery Program (IODP)—a dual-energy X-ray computed tomography (CT) data set of our cores. We specifically thank Barry Newton for the rapid and careful scanning; Brendon Hall for the continuous tutoring and updating of the CT data set; Eric Jones for in-kind support, including use of Enthought’s VirtualCore software; and Hans-Joachim Wallrabe-Adams for making these data available for the Onshore Science Party and integrating with CoreWall for visual core descriptions. We are grateful to the Center for Marine Environmental Sciences (MARUM) staff, especially the leadership of Ursula Röhl, who deftly balanced institutional and programmatic needs with multiple requests from scientists, which allowed us to maximize the scientific output from these unique cores from the Chicxulub impact crater. And we thank the IODP Publications staff, who carried on working long after we had disappeared for dinner. Lastly, thanks to all of the families of the expedition team members for their support before, during, and after our adventures in México and Germany. The new IODP differs from prior scientific ocean drilling programs in that it has neither a central management organization nor commingled funding for program-wide activities. Yet, this phase of IODP retains a fundamental integrative structural element: a “bottom-up” evaluation of all proposals for drilling expeditions by a single advisory structure composed of scientists representing all international program partners. International scientists may submit drilling proposals to the Science Support Office; all submitted proposals are then evaluated by a Science Evaluation Panel in the context of the Science Plan. †Participated in shipboard and shore-based operations. ‡Participated in shipboard operations only. Co-Owner of Montco Offshore Inc.
Rodriguez-Tovar, F.J., Morgan, J., Gulick, S., Mellett, C.L., and Expedition 364 Scientists, 2017. Establishment of a representative macrobenthic tracemaker community after the Chicxulub impact: ichnofabric analysis at IODP Expedition 364 [presented at the International Ichnofabric Workshop 2017, Taipei, Taiwan, 29 April–7 May 2017]. Poelchau, M.H., Riller, U., Gebhardt, C., Morgan, J., Gulick, S., and Expedition 364 Scientists, 2017. IODP-ICDP Expedition 364: drilling the peak ring of the Chicxulub impact crater [presented at the IODP-ICDP Kolloquium 2017, Braunschweig, Germany, 14–16 March 2017]. Schulte, F.M., Riller, U., Grieve, R.A.F., Kring, D.A., Claeys, P., and the IODP Expedition 364 Science Party, 2017. Structural characteristics of the impact melt rock and suevite of the Chicxulub peak ring—initial results from IODP-ICDP Expedition 364 [presented at the IODP-ICDP Kolloquium 2017, Braunschweig, Germany, 14–16 March 2017]. Riller, U., Poelchau, M., Rae, A.S.P., Kring, D., Grieve, R.A.F., Lofi, J., Morgan, J., Gulick, S., and the IODP Expedition 364 Science Party, 2017. Mechanisms of deformation during peak-ring formation of large impact structures inferred from Expedition 364 drill core [presented at the IODP-ICDP Kolloquium 2017, Braunschweig, Germany, 14–16 March 2017]. Riller, U., Poelchau, M., Rae, A.S.P., Kring, D., Grieve, R.A.F., Lofi, J., Morgan, J., Gulick, S., and the IODP Expedition 364 Science Party, 2017. Target-rock fragmentation during peak-ring formation of the Chicxulub impact structures inferred from Expedition 364 drill core [presented at the 11th Latin American Colloquium 2017, Heidelberg, Germany, 5–8 April 2017]. Schulte, F.M., Riller, U., Grieve, R.A.F., Kring, D.A., Claeys, P., and the IODP Expedition 364 Science Party, 2017. Structural characteristics of impact melt rock of the Chicxulub impact crater, Yucatan Peninsula, Mexico: results from IODP-ICDP Expedition 364 [presented at the Latin American Colloquium 2017, Heidelberg, Germany, 5–8 April 2017]. Le Ber, E., and Expedition 364 Scientists, 2017. High impact drilling: Chicxulub and its peak ring [presented at the Leicester Literary and Philosophical Society Annual General Meeting, Leicester, England, 24 April 2017]. Morgan, J., 2016. Keynote: Chicxulub K-T Impact Crater IODP Expedition 364 [presented at the 2016 UK IODP General Conference, London, UK, 15 November 2016].